VoV has secured invitation for translator and maître de conférences, Cam Thi Doan (INALCO) and historian Emmanuel Poisson (Paris VII Diderot) to speak at Cornell University, November 1st, 2017. Their lunch and evening conversations will address the role of Vietnamese language literature and texts, its limits and its audiences. Cam Thi Doan, will speak about the status of contemporary Vietnamese literature in France and Vietnam as well as its progression, renewal and transformation since the Đổi Mới period of the 1980s. Emmanuel Poisson will discuss the import of Vietnamese language texts and its translations in relation to his work as a historian of modern Vietnam. More official information on these events to come soon! Exciting news! Thank you, CCA! The Cornell Council for the Arts has generously decided to fund my first to-be-realized creative project! Last name Tran (Ba họ Trần) is a theatrical piece that I began working on since coming to France for research June 2016. Last summer, when I was at the colonial archives in Aix-en-Provence looking at material on Vietnamese students in France, I learned about labor conscription during the interwar period. Vietnamese laborers were brought to France to contribute to the war effort. For some it was an attractive opportunity to come to France, learn French, and earn regular pay. For others, it was confusing: whose motherland were they contributing to, France or their own? Among the laborers were also young Senegalese and Malagasy men who were separated according to their size and abilities to work. After watching the documentary Công Binh, La longue nuit indochinoise (2013) by Lê Lâm, I was inspired by the director’s ability to weave multiple artistic elements in his work of historical narration, as well as by the urgency to capture stories that would soon be lost over time. When I watched the documentary and listened to the interviews, I imagined the laborers’ daily lives and their various experiences entering metropolitan France for the first time. The theatre piece focuses precisely on these imagined reflections and interactions in a gunpowder factory in southern France, and incorporates elements of my research including the understanding of freedom, the imaginary of metropolitan France to colonial subjects, as well as the interaction among these colonial subjects. It follows Thanh, an ambitious youth in his early 20s who never finished his baccalaurat due to costs, Cuong, a wise forty-year-old who hides his ability to read Nietzsche regularly because of the tensions with Germany at the time, and enthusiastic Loic, renamed from Luan, who is as paradoxical as he is confused about colonialism, communism and all the –isms in between. The three meet at the factory, sharing nothing but their last name, Tran, in common. Aix-en-Provence: Think impressionist Paul Cézanne, Southern California weather, fountains and spouts at each corner. 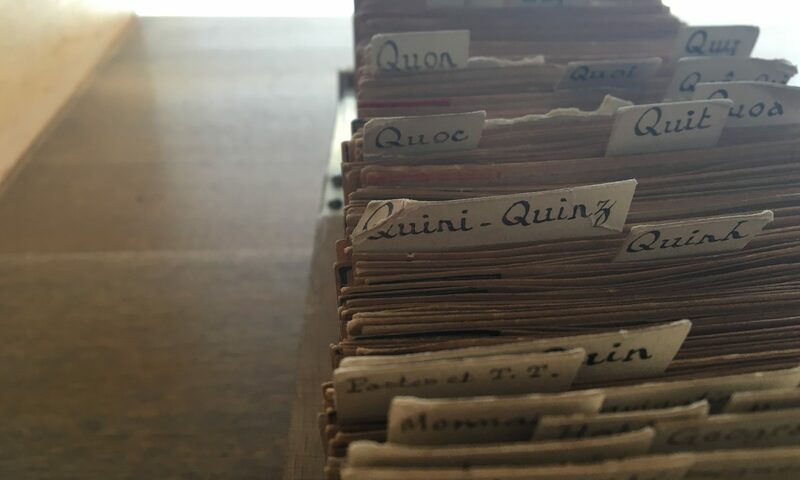 Archives Nationales d’Outre Mer: Imagine perforated ceilings, spontaneous connections with other researchers, laughs and gasps out loud. Archival research itself is a tedious process that requires an impressive amount of self-discipline and patience – my saying this is not an indicator of any experience or mastery, on the contrary, I think it actually demonstrates how green I am in this method of learning. Only when you know exactly what you’re looking for, or have figured out a certain kind of momentum that gets you going, does the research sail less on your conscious effort but on a rhythm of its own. But, as one should be, I am very excited that my interests have brought me to this part of the world and to this kind of library. I came to Aix looking for two things, one specific and one less so: a François Piétri discourse given at a Congrès de la Fédération des Anciens Coloniaux for a paper I wrote on Pham Quynh, and information on Vietnamese expatriates in France in the early 20th century. But the things you look for are never easily found, and when you’re only passively looking, there are too many things to be looked at. I’m not sure the Piétri discourse actually exists, and the closest thing to verifying that it does is a bulletin of the Fédération that is unfortunately infested with a bacterial fungi that makes it inaccessible indefinitely. I also realized, clearly very tardily, that the SLOTFOM, the fonds that holds materials on some of these expatriates are a multi-numbered series, with lots of miscellaneous information. In any case, it’s only been my third day at the archives; my feet are definitely wet. My little quest looking for Pham Quynh, filed under Q and not Ph!